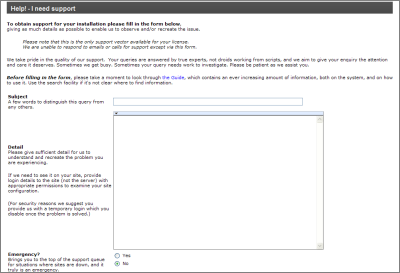 General self-serve configuration support is available in the Support website. Nearly every configuration 'question and answer' we have previously received has already been converted into KB articles and 'How to...' topics. General component configuration support by email is always free of charge for purchased licenses. All purchased (paid-for) licenses are eligible for Premium support. Simply request support via the Premium support link located on your free personal account page. Requires a valid license with current upgrade protection and use of the latest Release build. Log into your account with the details you received at sign up. If you skipped creating an account when you started - no problem - simply create one now, and associate your existing Installation Id with your account. Just follow the wizard. 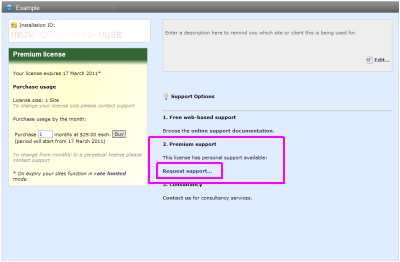 Locate the 'Premium Support' section of the page, and click the Request support... link (highlighted above). You will get a prompt response to your request for assistance. Please read the notice and warnings regarding the use of Emergency help. 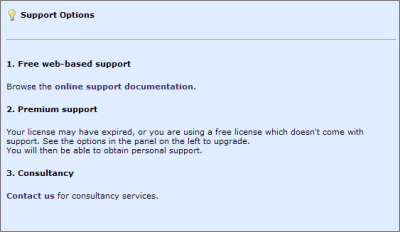 If there is no 'Request support...' link available that means either you are using a Free license which does not come with Support, or your license has expired. You can purchase a license at the Premium License panel on the same page. Use the best onlineHTML, CSS and JS tools at html-css-js.com: editors, code optimizers and more.